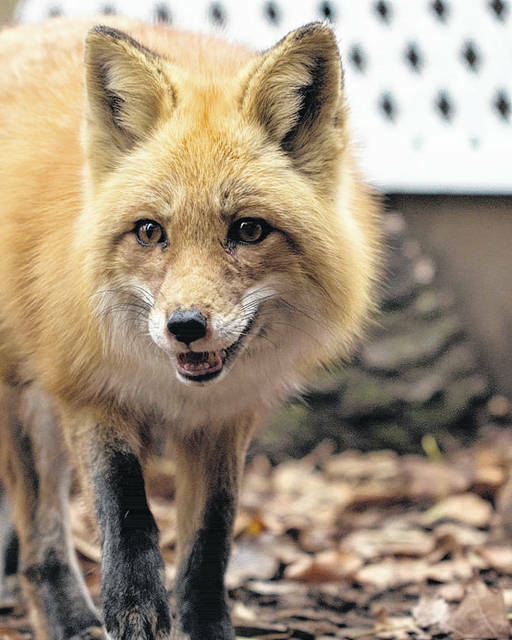 It’s surprising to some people that red fox sightings have increased in Ohio’s urban and suburban habitats. A common question is, “How did the fox get here?” The answer is not that complicated. This animal is often portrayed in stories as cunning and a trickster because of its ability to adapt to many situations, and it can definitely find a safe spot in your yard. While some people are excited and intrigued by a red fox so close to the house, others are concerned. Sometimes these are the same people that enjoy seeing wildlife in a park setting, but do not want a fox in the backyard. Remember that seeing different wildlife species (such as a red fox) is a great thing. It’s a sign that habitat conditions for wildlife have improved. We see improvements to fox-friendly habitat all the time, such as the naturalized meandering of once-channelized streams, or the planting of grass buffers strips adjacent to waterways. These changes have increased food and shelter for all sorts of wildlife. A species such as the red fox can expand its range after these habitats are reestablished and resources become more plentiful. These critters then seem to find ways into our backyards as the habitat increases. This is because we provide excellent denning areas under our sheds, decks, and around our swimming pools, and the fox takes advantage of these spaces. The soil around our homes is often soft and easy to dig in, or better yet, we have created ready-made den sites with roofs and dry spaces that practically beg for a new tenant. We also provide food and protection for the fox. It finds rabbits, mice, moles, small birds, and even pet food in our urban neighborhood. It only takes a small space to make a red fox feel comfortable. It chooses an urban yard because everything that it needs to survive and reproduce is close by. Food, water, and shelter are provided in abundance. All species of wildlife, including the red fox, spend an incredible amount of time and energy reproducing and raising young. A fox picks a den location because it finds all the elements needed to successfully raise a litter. Remember that a fox will use the same den site year after year. If you decide that you don’t want them to use your yard, once the kits are gone you need to exclude access to the site. On the other hand, you probably don’t have problems with pesky rodents such as mice if you have a family of foxes in your yard. Enjoy the brief time you have observing the visitors. It can be quite entertaining to watch a family of foxes learning to play and hunt. The time will go by fast. Then, if needed, you can do any exclusion work required to keep them from coming back. – The red fox takes its name from its most common color phase, a rusty-red coat. Its undersides, throat, and cheeks are white. The legs, feet, and outside of the ears are black. Its long tail ends in a white tip. The tail can be used to help identify it; a gray fox’s tail has a black tip. – A fox’s home range extends up to two miles, but it will search farther out if food is scarce. It typically eats mice, rats, rabbits, groundhogs, other small mammals, birds, fruits, acorns, and some grasses. The fox is nocturnal and usually hunts at night. – Peak breeding activity occurs in January and February. A litter typically consists of five or six kits. The female digs a den from scratch in loose, sandy soil with a southern exposure. Most fox dens are about four feet below ground. The female nurses her offspring while the male brings food to the den. The male continues in this role until the young can go on hunting trips to learn basic survival skills. The family unit breaks up by fall of the same year. – Fox hunting and trapping season is Nov. 10, 2017-Jan. 31, 2018. A hunting license and fur taker permit are required, and there is no bag limit. Learn more about fox hunting and trapping at wildohio.gov.